With the help of cryopreservation, hospitals could store organs for extended periods of time, making organs more accessible to patients in need of transplants. Image courtesy of Wikipedia Commons. From Star Wars to Futurama, science fiction just would not be complete without cryopreserving a couple of heroes. Of course, the ability to freeze humans and revive them centuries later remains well out of reach, but cryopreservation has been a topic of investigation among researchers for years. The process relies on a concept similar to that of food refrigeration: Low temperatures limit the rate of chemical reactions that damage tissue, which theoretically can extend a tissue’s lifespan. And although we have yet to freeze entire humans, this idea has promising applications in the preservation and storage of human organs. Organs are a high-demand, low-supply resource to harvest. In the United States, only 28,000 organs were transplanted in 2012, but over 100,000 patients are still on an organ transplant waiting list. Given their incredible value in improving and saving human lives, efforts to better preserve organs are paramount. Currently, organs must be transplanted within hours even when they are kept in cold storage. However, if scientists could develop a method to freeze them, their deterioration could be delayed for months, and hospitals could start banking organs for future use. 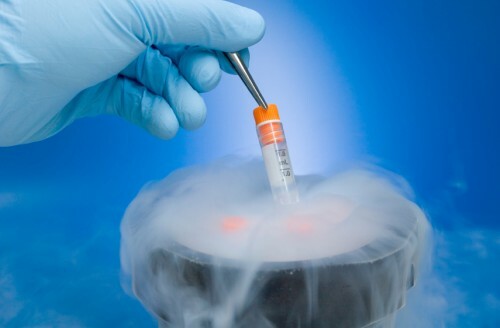 Liquid nitrogen is often used to cryopreserve samples at the lowest possible temperatures. Image courtesy of ISIS Regional Fertility Center. Currently there are a number of barriers to successful cryopreservation efforts. Despite a small number of notable exceptions, complex tissues still cannot be preserved for extended periods of time. One of the major problems with cryopreservation is the detrimental effect of freezing on cellular fluid flow. At below-freezing temperatures, the water between cells freezes first, and the extracellular fluid becomes more concentrated with metabolites and proteins as the volume of liquid water decreases. In order to counterbalance this change, water rushes out of the cell to create a buildup of extreme pressure. When more than two-thirds of the water has left the cell, its structure irreversibly collapses. To address this challenge, scientists are investigating the role of some natural cryoprotectants, such as glucose and glycerol, which prevent cell collapse by lessening the concentration gradient between the exterior and interior of the cell. Another major issue with cryopreservation is the tissue damage caused by thawing. Slow thawing leads to the formation of ice shards, which can puncture cells. Furthermore, when ice crystals melt, they create small pools of water in the extracellular spaces of tissues. These small pools disturb the osmotic balance of the cell by creating pockets of low concentration and ultimately lead to cell swelling. 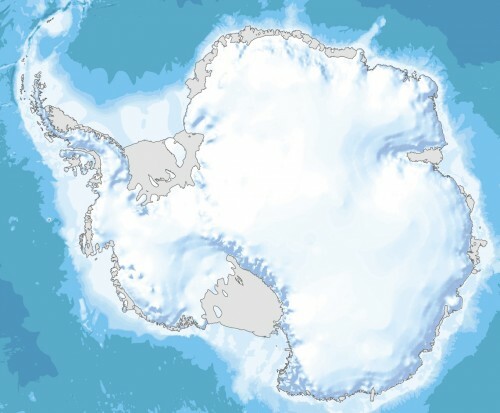 Many organisms that live in Antarctica are equipped with the ability to survive at freezing temperatures. Image courtesy of Salamanca Art Center. Belgica antarctica, an Antarctic fly which is the world’s southernmost insect, may hold the solution to osmotic balance problems. The fly’s larva lives for two years in Antarctica while mostly frozen and spends the remainder of its life cycle on the continent as well. Although it does have elevated levels of cryoprotectants, including glycerol and glucose, what seems to ensure its survival are membrane proteins called aquaporins that regulate the flow of water in and out of cells. These proteins remove most of the water from the fly’s body. Thus, by simply decreasing the amount of water in its body, the midge effectively minimizes the damage caused by freezing and thawing. However, this solution is much less practical for humans because of the strain that dehydration places on cells. In addition, while midge larvae can survive with more than 70 percent water loss, humans cannot survive after losing more than 15 percent of their body water; thus, it remains prohibitively difficult to dehydrate organs, let alone entire humans. Other examples in nature make scientists hopeful. For instance, Stanford University graduate student Art DeVries found a protein in Antarctic fish that enabled them to swim in water as cold as -1.9 degrees Celsius without freezing solid. Due to its repeating structure, the antifreeze protein (AFP) can to bind to ice crystals and inhibit their growth into larger crystals, effectively lowering the freezing temperature of organisms to -2.5 degrees Celsius. AFPs have also been identified in other organisms, including snow fleas, beetles, and caterpillars. 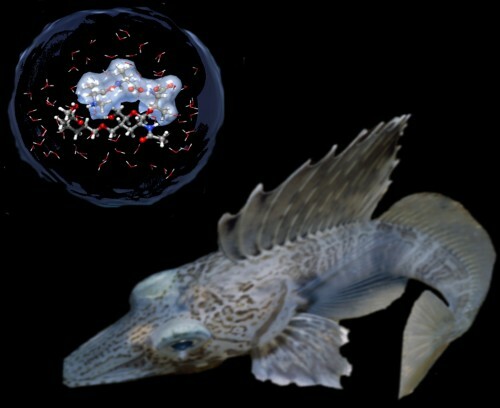 Stanford researchers found that a species of Antarctic fish contains a specific antifreeze protein that prevents the buildup of large ice crystals within its body. Image courtesy of Konrad Meister. Although applying AFPs to mammals is more challenging because they maintain distinctively high body temperatures, there is at least one case in which scientists have successfully utilized this technique to improve heart preservation time. In 2005, a group led by Dr. Boris Rubinsky of the University of California, Berkeley and Dr. Jacob Lavee of the Sheba Medical Center in Israel preserved rat hearts in a fish AFP solution. Cooling the hearts to -1.3 degrees Celsius extended their preservation time from four hours to 21 hours. Advances like these show that nature can be a valuable mentor: Although cryopreservation presents a number of microfluidic challenges, many creatures have evolved techniques to tackle them. With further research, current studies that focus on smaller tissues in animal models may eventually be applied to human organs. Finally perfecting the technique of human cryopreservation may take decades, but the allure of preserving life keeps scientists motivated.